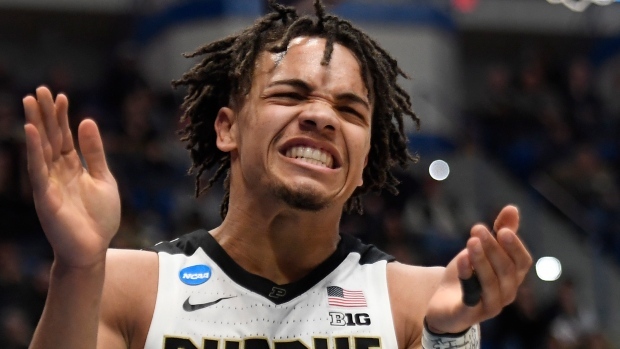 HARTFORD, Conn. -- Carsen Edwards scored 26 points and third-seeded Purdue coasted to a 61-48 victory against Old Dominion on Thursday night in the first round of the NCAA Tournament. Edwards, the Big Ten's leading scorer, has been slumping recently and dealing with a sore back that he insisted was fine on Wednesday. The junior guard had shot 32 per cent in his last 11 games, and was 7 for 33 from 3-point range in his last three games. It got no better for the Monarchs in the second half. Matt Haarms, Purdue's 7-foot-3 centre made a 3 from the corner to make it a 17-point game with 16:50 left in the second half. It was Haarms' seventh triple of the season. A minute late, Edwards pulled up for a long 3 that made it 43-23 and prompted ODU coach Jeff Jones to call a timeout. Old Dominion: The Monarchs have to replace their top two scorers (Stith and Caver) and 7-foot-1 centre Elbert Robinson.